Are you using QR codes? Here are some common wins and fails with this mobile internet fad. For those who don’t know, QR codes are those funny block barcode patches that have been showing up worldwide on park benches, brochures, menus, flyers and more. Once scanned with one of the dozens of QR code phone apps available, it can direct you to any number of online resources. Webpages, Twitter, You Tube, phone numbers, logins, calendars, Skype, Paypal, the possibilities are virtually endless. For those who don’t know, QR codes are those funny block barcode patches that have been showing up worldwide on park benches, brochures, menus, flyers and more. Once scanned with one of the dozens of QR code phone apps available, it can direct you to any number of online resources. Webpages, Twitter, You Tube, phone numbers, logins, calendars, Skype, Paypal, the possibilities are virtually endless. QR codes are definitely being pulled out of the marketing toolbox now more than ever, and while these may be a fad in the long-term, they’re certainly not getting less popular anytime soon. And why not, they’re easy to create, easy for consumers to scan and they have the power to lead someone to rich online content with the wave of an iPhone. But as Spider-man’s Uncle Ben once said, “With great power comes great responsibility.” You can’t just slap a QR code on a brochure and expect it to do wonders for your conversion rate. It’s your responsibility to ensure that the content that a user sees after they scan your QR code enhances their experience with your product or your brand and gives them added value that they wouldn’t have otherwise gotten had they not scan the code. Here I’m going to outline some ways that you can utilize QR codes to add value for your customers, stand out from your competitors, and look good doing it. 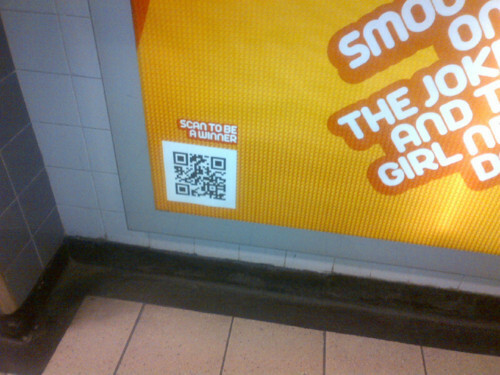 And like all tech trends and fads, QR Codes are subject to some strange abuses. I’m also going to give you a list of bad practices you’ll want to avoid at all cost. Contests.What a great tool to get consumers to participate in a contest. With a simple scan, you can direct them to enter their information directly into your inbox with an email address or an online form, you can even ask trivia questions. QR codes make it even easier to get creative with your contest; think of the other technology involved in owning a smartphone, videos, images, etc. Selling Tickets. Putting on an event? Slap a QR code on your marketing that sends viewers directly to a page where they can register or purchase tickets right there on the spot instead of putting it off for forgetting all together. You can include additional information such as the agenda and schedule for your event, as well as the venue location. Google Maps. A QR code can contain a geographical location. Scan the code on a poster advertising for a restaurant and its location becomes available to your navigation software, informing you how to get to that place. You can quickly give users directions to your business, events or location with a linked QR Code. With the popularity of GPS apps and their integration into everyday travel, this can be a helpful tool. YouTube Videos. People can kill hours on You Tube for a reason; we like the visual and audio experience. Sending a consumer to a product demonstration can give you an edge over other providers. While standing in front of your product, they can be seeing it in action. Other video options could include information, question and answer, etc. A very popular alternative is to go for entertainment value; consider the ever popular “Will It Blend” videos on You Tube. The possibilities here are endless. Facts and Trivia. What a great resource for organizations to give users access to trivia, history or facts. Non-profits could really get the public involved and raise awareness with a fun community wide QR code campaign. Technical Specifications. Manuals, technical information how-to-guides, these things can be available at the touch of a button. You can give consumers an entire arsenal of info to help them choose and use your product. Contact Cards. That’s right, a QR code can actually allow clients to scan your contact information directly into their phone. Easy and convenient! On Your Website. They’re already at your website, where are you going to send them that you couldn’t just link to? And if they’re currently viewing your site with their phone, they won’t be able to scan it either. Waste of web space better utilized. Email Signature. While there’s nothing wrong with putting a QR code on your contact card or business literature, it’s pointless to put it in your email signature. If they’re using their phone to view your email, they can’t scan the code. If they don’t have a smartphone at all, they won’t be scanning the code. Unless your clients typically print their emails, you’re not going to catch very many fish with this pole. Non-Mobile Friendly Websites. People scan QR codes with their phones and will subsequently be viewing the linked content…on their phones! If you send them to a non-mobile friendly website, you’re going to get grumpy consumers who question your business savvy. Size Matters! The minimum dimensions of a QR code depend upon the resolving power of the cameras that are used to scan the code. According to a Kaywa white paper, it is recommended to use a minimum size of 32 × 32 mm or 1.25 × 1.25 inches, excluding quiet zone, for QR codes that contain a URL. This guarantees that all camera phones on the market can properly read the bar code. Changing the size to a width and height of 26 × 26 mm or roughly 1 square inch still covers 90% of the phones on the market. Any smaller than that and your code only becomes usable by a tiny percentage of people. Location, Location, Location! Billboards on the highway? Pretty sure driving with your iPhone out the window trying to get a picture of the QR code as you whip by at 110kph qualifies under the distracted driving laws. Any scan that requires a viewer to get a ladder, crouch down on the ground, risk dropping their phone into a toilet tank, etc, is not a good idea.